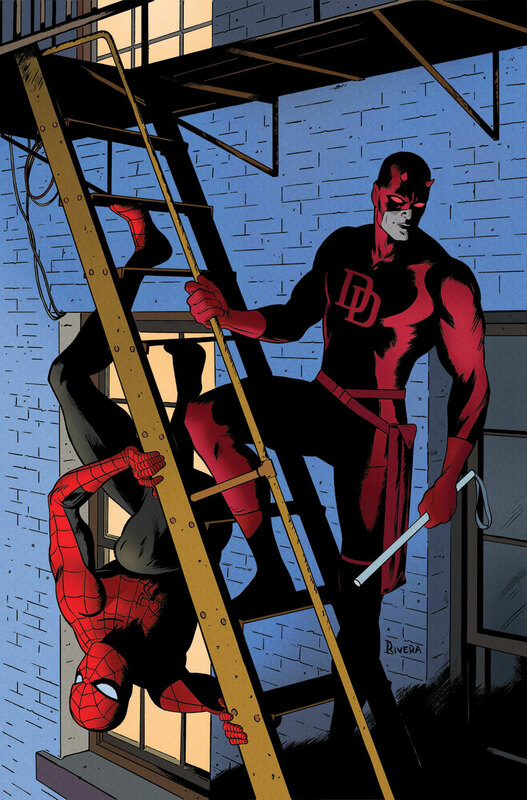 Anyway, Daredevil is apparently gearing up for a crossover with Spider-Man in January in the pages of Daredevil #8 and Amazing Spider-Man #677. The story will be by Mark Waid, Emma Rios, and Kano and feature an appearance by the Black Cat. 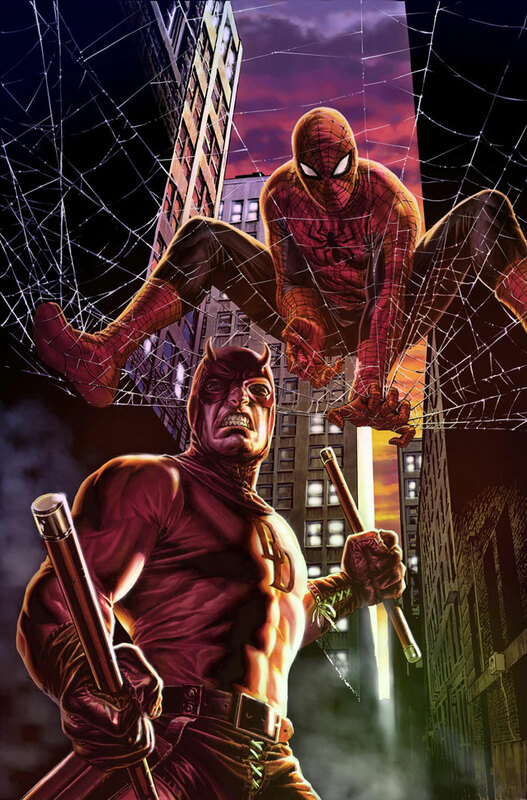 This sounds pretty cool to me, Daredevil and Spidey make for a good team and it will be fun to see them playing off each other. As mentioned in my last post I was at the Amazing Spider-Man panel and had a great time. 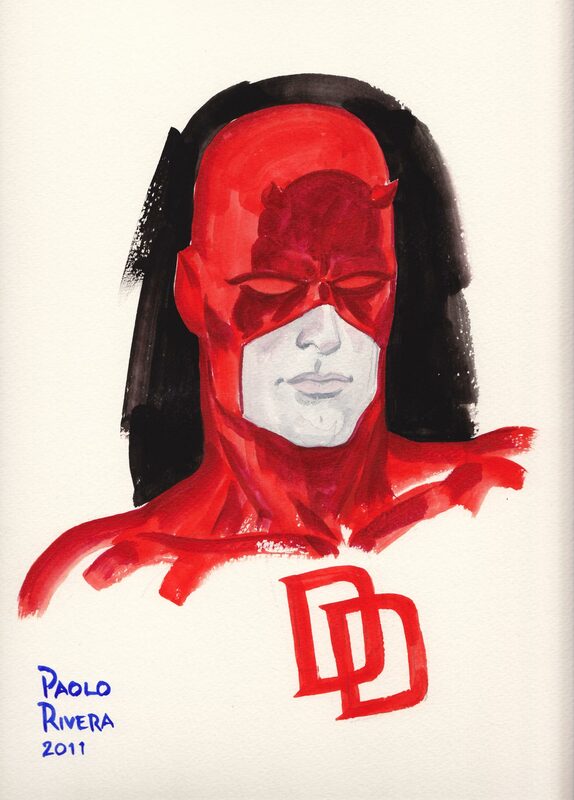 While at the con I also took the opportunity to get my very own piece of Daredevil art by none other than Paolo Rivera! 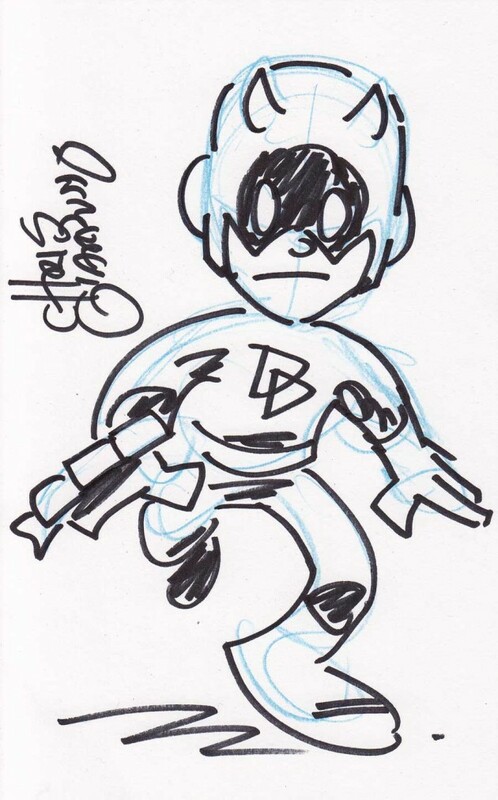 I also got an adorable Daredevil sketch from Chris Giarrusso. Anyway, tomorrow it’s time for Aaron’s first post so be sure to stop by then and let him know what you think! I vote yes on the cosplay. I suspect you’d be awesome. And ooooh, Paolo Rivera! Yes! You should cosplay as Black Widow… that would be awesome. Hmm… I guess Daredevil #8 isn’t going to make much sense to me. It would have been better to have Spidey just guest star in 2 issues of DD. As awesome as Waid’s issues have been so far, I consider them shoving a crossover with any other book this early in the new series a serious strike against. A Convention Sketch done brush… Wow! Black Widow it is then! Very cool art, love the original Rivera and the cute little Daredevil. 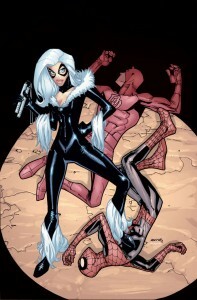 I also love DD Spider-Man teamups, but now I have to buy more books (not a fan). Love the sketches, Chris G. has always been a favorite of mine too. Wow, reading your posts on New York Comic Con it sounds like we were in the same place at same time a few times! From the spot you were in line on Friday (by that truck) to the place where you took photo at Spider-man panel..too funny. You were in NY on a very comics dedicated trip. Did you visit Hell’s Kitchen? :-). Last time I was in NY i simply wasn’t that interested in comics but I’m going to NY this spring to visit my brother who’s doing post-doc over there. I will do surely do a pilgrimage to Hell’s Kitchen ;-).